Coach, four wheel drive, air, train and more. 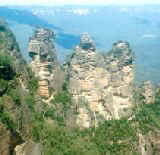 The Blue Mountains are located just outside of Sydney, Australia's largest city and most popular tourist destination. The Mountains are one of Australia's most popular tourist destinations, and are well catered for by tour operators. Many coach companies operate 1 day and longer tours of the Blue Mountains. Some include stops at places of interest in Western Sydney, such as a wildlife park. All-day pass. Hourly service to 27 stops around Katoomba & Leura. Full & half day tours from Katoomba. Catch the train from Sydney & save. Join us and let Sydney’s original nature based tour company take you on an unforgettable adventure to the Blue Mountains which we guarantee will be one of the most enjoyable days you’ll have in Sydney. Four and six wheel drive coaches, with comfortable seats and air-conditioning, operate tours into the rougher areas. Personalised 4wd tours with knowledgeable local guide. Cave to rent, with most modern conveniences. Provider of upscale, personalised, 4WD tours. Some of the best places can only be reached on foot. Explore the wilderness on foot & bring a contrast to your life - whether it be a challenging trek for adventure, stress-relieving walking holiday or a gourmet night in the bush – leave all trace of civilization & enjoy the splendour & solitude. Small planes and helicopters offer sightseeing trips. Some helicopter trips include landing in the bush. World War 2 Jeeps, Harley Davidson motorcycles, horses, etc. Promote Your Tour Company Here! Copyright © 1998-2003 David JW Martin except where other copyright applies. All rights reserved. Company, brand and product names are the property of their respective owners. Revised: June 28, 2003 .